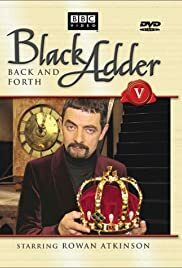 The final episode in the saga of the Blackadder family, who have forever been at the very center of British history and society. George: Well isn't this splendid and absolutely tufty? New years eve 1999. A new century and a new millennium. Let's drink a great big slurpy toast to peace and understanding around the globe. Melchett: Bravo! After all, if history teaches us anything, its that in in the words of St. Burt, what the world needs now is love, sweet love. Published by Memory Lane Music Ltd.
Old BBC shows are lovely, so low-budget and witty and strange. To a lover of literature and history like myself, Blackadder stands as possibly the funniest sitcom of all time. Like Doctor Who, it was cheap, but I didn't give a fig...it was simply ten times cleverer than anything on American television, and I loved it. At first, I was dubious about this millennium special - I didn't think that Blackadder really needed a big-budget makeover, special effects, etc. But in the end, "Back and Forth" served its purpose for me. I laughed. Lots. Maybe I would've liked a little more wit and a few less sight gags, but so what? It's been ten years since the original Blackadder went off the air, and it's unreasonable to expect that a new special will emulate the old show exactly. And in addition to the new material, there's plenty of nostalgic jokes on hand (e.g. "I have a cunning plan"...why do people complain that this was recycled here? Can you image Blackadder WITHOUT this line?). Like the recent big-budget Doctor Who and Asterix films, this was criticized by fans who were disappointed that it wasn't 4 stars all the way...but a general audience can forgive the odd flaw and accept this for what it is, a delightful reunion of great British comics for one last episode of a great show.